Nancy K. Kubasek received her J.D. from the University of Toledo College of Law in 1981 and her B.A. from Bowling Green State University in 1978. She joined the BGSU faculty in 1982, became an associate professor in 1988, and became a full professor in 1993. During her tenure at Bowling Green State University, she has primarily taught courses in business law, legal environment of business, environmental law, health care law, and moral principles. 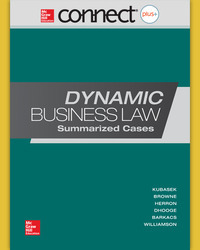 She has published over 75 articles, primarily in law reviews and business journals. Most of her substantive articles focus on environmental questions. She has helped get students involved in legal research, and a number of her articles have been coauthored with students. She has also published a number of pedagogical articles in teaching journals, focusing primarily on the teaching of critical thinking and ethics. She wrote the first environmental law text for undergraduate students, Environmental Law, and coauthored The Legal Environment of Business: A Critical Thinking Approach. She has written supplemental materials, such as study guides, test banks, and instructors’ manuals. Active in many professional organizations, she has served as president of the Academy of Legal Studies in Business, the national organization for professors of legal studies in colleges of business. She has also served as president of the Tri-State Academy of Legal Studies in Business, her regional professional association. In her leisure time, she and her husband, Neil Browne, fish for halibut and salmon in Alaska, as well as largemouth bass in Florida. In addition, they are regular participants in polka, waltz, zydeco, and Cajun dance festivals in Europe and the United States. For almost 30 years, they have been successful tournament blackjack players. Both are avid exercisers—lifting weights, doing yoga, and running almost every day. M. Neil Browne is a senior lecturer and Distinguished Teacher Professor of Economics and Law emeritus at Bowling Green State University. He received his B.A. in history and economics at the University of Houston, his Ph.D. in economics at the University of Texas, and his J.D. from the University of Toledo. He has been a professor at Bowling Green for more than five decades. Professor Browne teaches courses in economics and law, legal research, jurisprudence, ethical reasoning, critical thinking, and economics at both the undergraduate and graduate levels. He has received recognition as the Silver Medalist National Professor of the Year, the Ohio Professor of the Year, and Distinguished Teacher and Master Teacher at Bowling Green State University, as well as numerous research awards from his university and from professional organizations. His consulting activities with corporate, governmental, and educational institutions focus on improving the quality of critical thinking in those organizations. In addition, he serves as a Rule 26 expert with respect to the quality of the reasoning used by expert witnesses called by the party opponent in legal actions. Professor Browne has published 35 books and over 160 professional articles in law journals, as well as in economics, sociology, and higher-education journals. His current research interests focus on the relationship between orthodox economic thinking and legal policy. In addition, he is in the midst of writing books about the power of questionable assumptions in economics, the usefulness of asking questions as a learning strategy, and the deficiencies of legal reasoning. Linda L. Barkacs received her J.D. from the University of San Diego in 1993. She also has a B.A. in political science from San Diego State University and an A.A. in accounting from Irvine Valley College. Upon graduating from law school and passing the California bar exam, Professor Barkacs became an associate at a downtown San Diego law firm. During that time she was involved in a number of high-profile trials, including a sexual harassment case against the City of Oceanside that resulted in a $1.2 million verdict. In 1997, Professor Barkacs and her husband Craig (also a professor at USD) started their own law firm specializing in business and civil litigation (in both federal and state courts), employment law cases, and appeals. They were also involved in numerous mediations and arbitrations. Professor Barkacs began teaching at USD in 1997 and went full-time in Spring 2002. She is now a tenured Associate Professor of Business Law. As an educator, she has designed and taught numerous courses on law, ethics, and negotiation. She teaches in USD’s undergraduate and graduate programs, including the Master of Science in Executive Leadership (a Ken Blanchard program), the Master of Science in Global Leadership, the Master of Science in Real Estate, and the Master of Science in Supply Chain Management. Professor Barkacs often teaches in USD’s study-abroad classes and has traveled extensively throughout Europe, Asia, and South America. Professor Barkacs has received numerous awards for her teaching at USD, including the 2008 USD Outstanding Undergraduate Business Educator; 2008 and 2007 Professor of the Year, USD Senior Class (universitywide); 2007 Creative and Innovative Teaching Award, Academy of Education Leadership (national); and 2009 and 2010 nominee for U.S. Professor of the Year (Carnegie Foundation). She and her husband are principals in The Barkacs Group (www.tbgexecutivetraining.com), a consulting firm that provides negotiation, ethics, and team training for the private sector. Professor Barkacs has published numerous journal articles in the areas of law, ethics, and negotiation. She and her husband are coauthoring a book on negotiation. She has been the president, vice president, conference chair, and treasurer of the Pacific Southwest Academy of Legal Studies in Business (www.pswalsb.net). Professor Barkacs currently spends her time teaching, publishing, consulting for The Barkacs Group, and doing volunteer work for various civic causes. She enjoys walking, weight lifting, and spending her free time with her husband Craig and their three cats, Phoenix, Violet, and Vanessa. Daniel J. Herron is a professor of business legal studies in the Richard T. Farmer School of Business at his undergraduate alma mater, Miami University in Oxford, Ohio, where he earned a bachelor’s degree in English. He earned his law degree from Case Western Reserve University School of Law in Cleveland and is a member of the Ohio and federal bars. His research includes articles on business ethics plus a variety of “business and law” topics. In addition to his teaching and scholarly publications, he founded in 1994, and since then has been coaching, the James Lewis Family Mock Trial Program at Miami, a consistent top-10 program in a field of more than 300 mock trial programs nationwide. Before coming to Miami in 1992, he taught at Bowling Green State University, the University of Wyoming, the University of North Carolina–Wilmington, and Western Carolina University. He has been married for over 35 years to Deborah, and they have two children, Christopher (married to Amanda) and Elisabeth (married to Mark). They have four grandchildren—Jack, Nate, Samantha, and Wesley—plus two rambunctious beagles, Max and Missy. Lucien J. Dhooge is the Sue and John Staton Professor of Law at the Scheller College of Business at the Georgia Institute of Technology, where he teaches international business law and ethics and serves as the area coordinator in law and ethics. Prior to his tenure at the Georgia Institute of Technology, Professor Dhooge practiced law for 11 years and served on the faculty of the University of the Pacific in California for 12 years. He has authored more than 50 scholarly articles, coauthored and contributed to 13 books, and is a past editor in chief of the American Business Law Journal and the Journal of Legal Studies Education. Professor Dhooge has presented courses and research throughout the United States, as well as in Asia, Europe, and Central and South America, and has received numerous research and teaching awards, including seven Ralph C. Hoeber Awards for excellence in published research. After completing an undergraduate degree in history at the University of Colorado, Professor Dhooge earned his J.D. from the University of Denver College of Law and his LL.M. from the Georgetown University Law Center.